By Professor Robert Faurisson. He is virtually the only revisionist to be concerned with the effects of the Judaization of the Roman Catholic church, which has become very evident since Vatican II both in terms of foreign policy which is the concern of this book and in reform to worship. 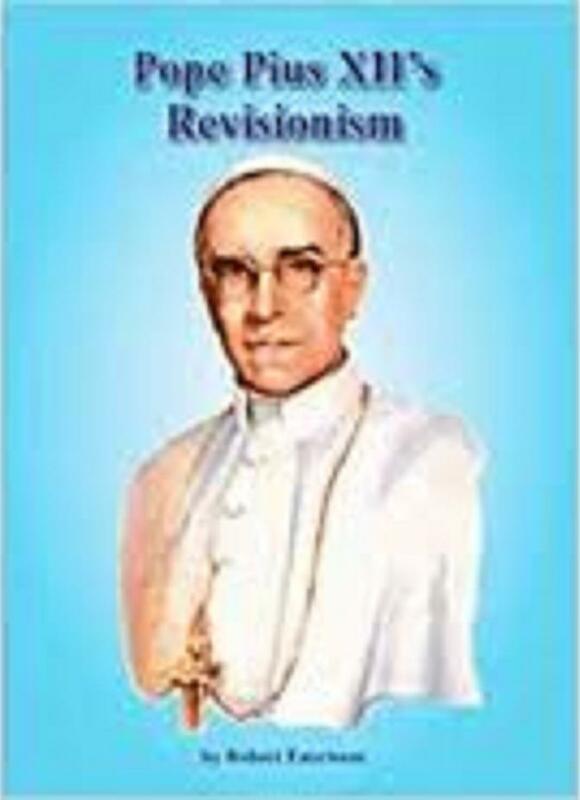 Favourable to the Allies and obligingly helpful to the Jews, Pius XII was also a revisionist. It is precisely his revisionist’s scepticism, and not any ignorance of the facts, that explains his silence on the alleged physical extermination of the Jews, on the alleged Nazi gas chambers and on the alleged six million Jewish victims of what today is called the ‘Holocaust’ or ‘Shoah’. For those who wish to do so, the only way to rehabilitate of the maligned Pope is to reveal the facts. Additionally this volume contains: A fake: John XXIII’s ‘Prayer for the Jews’; Jesus’ fate according to The Talmud; Six questions to John Paul II about Edith Stein; A letter from Henri Roques to Henri Amouroux. P/B, 104pp. Please note that this item is being reprinted, as is almost out of stock. Customers would have to accept some delay in delivery.